Hey starshines! How are you all doing? Here's a review of a product that I've really been loving lately. You might have seen this in my haul post *here. * Pencil liners (which are the easiest to use) tend to smudge on me even with primer #onethingihateaboutmonolids. 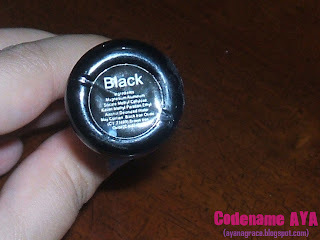 I was looking for a liquid eyeliner that's newbie-friendly. Lo and behold, the Fashion 21 Dipliner. I got mine in black. I think they also have a brown one. The packaging is just ok. The cap is long but not as long as that of the Etude House Proof 10 Eye Primer. 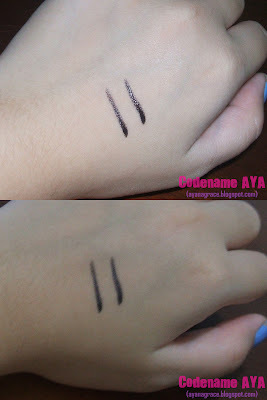 It has a felt-tip applicator which is nice especially for people who aren't used to using liquid liners yet. It's not flimsy and the tip is nice and pointed and allows you to create thin lines. Here's to see how smudge-proof this liner is. First, I tried removing the lines using my dry finger (A), but to no avail. No fading, no smudging. Once this liner dries, it's very hard to smudge. Next I tried running water on the back of my hand (B). The lines didn't budge so I guess that means the liner is kind of water-resistant. Lastly, I tried rubbing the lines while my hand was still wet (C). The lines faded but they didn't smudge. So I guess that means this is not waterproof. Yeah, so it is water-resistant but not waterproof. Does that make sense? Easy to remove - I use the Etude House Lip and Eye Remover to remove this. Availability - Can be found at Fashion 21 counters at Watsons, SM and Landmark Department Stores. Check Fashion 21's website *here* for the complete list. Drying time - I wish it dries more quickly. Any eyeliner suggestions? Which do you prefer: pencils, liquid or gel liners? 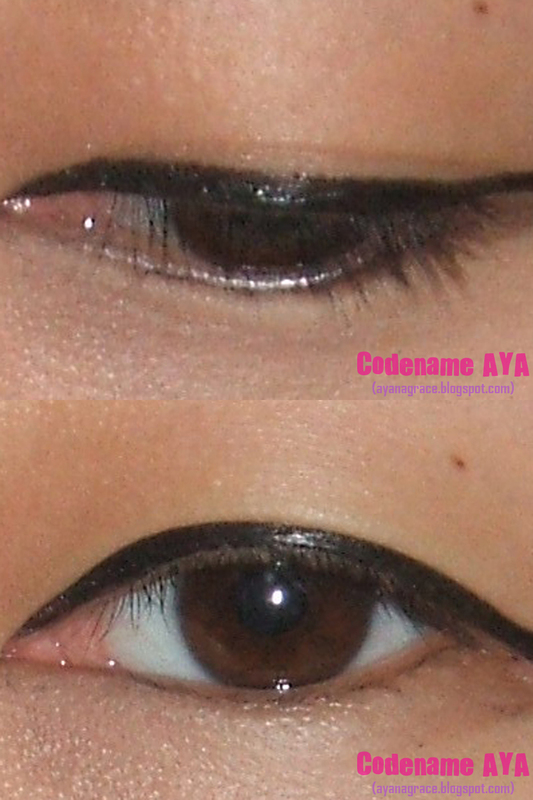 love this eyeliner so much! :D i only use wipes to remove this eyeliner! awww wish i could get this in the US :) hehe. i'm not really good with liquid eyeliner.. i can't draw the line really well and it always comes out all sqiggly hehe. It looks lovely on you!! I've heard so much about this liner. Now I'm so getting one...hehe awesome review sis! Loll, at first I read your title as "Forever 21". @Hollie, I hope it will work well for you :) Thanks! you put liquid liner so well! I only tried using liquid liner once. I actually like gel liners best because they stay on for hours and they don't smudge or budge even on my waterline (even if it's not recommended to apply it on the waterline, I still do it anyway :D) .. And I also like pencil liners for everyday use. You always have the best reviews. I cannot do liquid liner to save my life!!!! It's horrible. Seriously. Hot mess. Noice I use this too *high fiveee*! I've been thinking about getting this when my Nichido runs out. Thanks for the review! nice review! I'm currently using Ever Bilena's Dip liner. But I might buy this one soon too. Thanks for sharing. impressive performance for an inexpensive product! This Liquid Liner Is Always And Always Gon' Be Mah Preference! It Really SERVES ME WELL Or WAY TOO WELL! And It's Perfect For Rakista-Style Makeup, And Trust Me, I've Been Using This For About 5 Years!